The Bounous family is a skiing legacy. 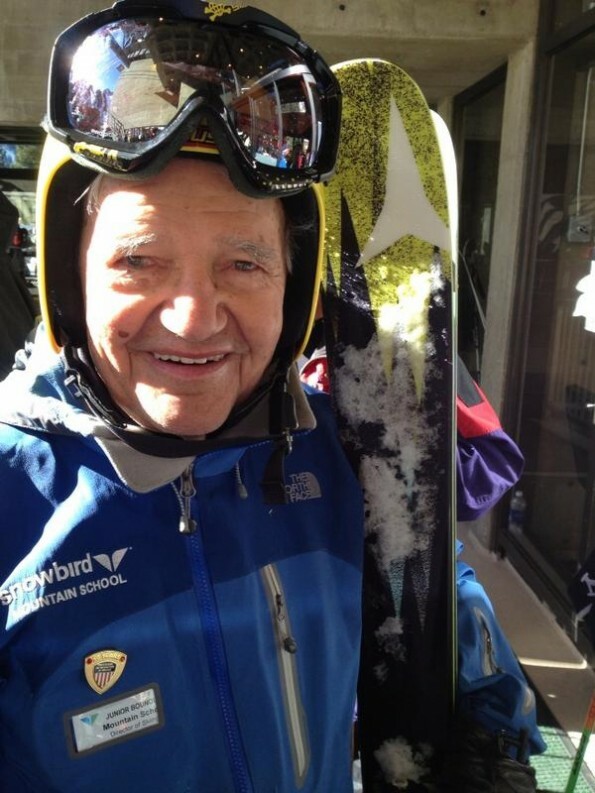 Junior Bounous, now 90, started skiing with homemade skis made from barrel staves. When he was around 8, his mother gave him his first pair of “real skis” which he used on the hills of Provo Canyon. There were no ski resorts at the time and so skiing involved a lot of hiking. Junior competed for the first time in High School in cross country. 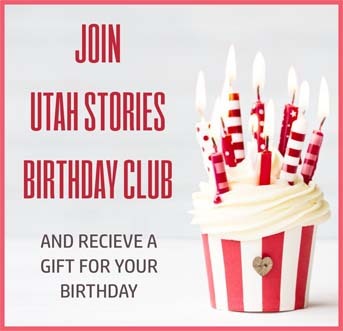 At that time he and friends skied under the Timp Mountain Ski Club. 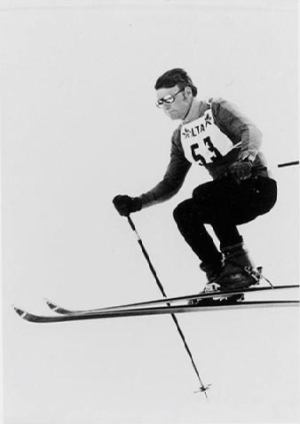 He loved competing, but turned his attention to teaching, starting by giving classes through Provo Recreation and the Provo Herald Ski school. 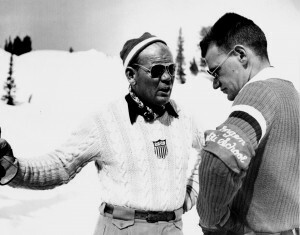 He became a certified instructor in 1948 and was hired by Alf Engen to teach full time at Alta. He helped set up a ski school at Sugar Bowl in California during the winter and spent summers in Provo working on the family’s fruit farm. 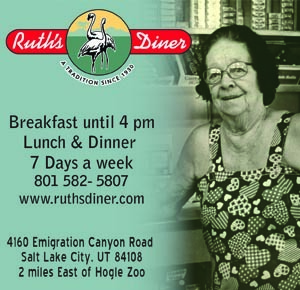 He was part owner of Timp Haven in Provo Canyon. It was later sold to Robert Redford and renamed Sundance. In 1971 he was hired by Ted Johnson at Snowbird to help develop the new ski resort and then became ski school director there. He “semi- retired a few times and officially turned in my uniform last April and I’m now fully retired.” His title was, Director of Skiing, which he says it part honorary and part working with the public – skiing with different people, taking them on tours . Photo Courtesy of the University of Utah J. Willard Marriott Library Special Collection. Junior’s oldest son, Barry Bounous teaches voices at BYU with his wife and carries on the family ski legacy by teaching skiing at Sundance on Saturdays. Junior’s second son, Steven Bounous, learned skiing from his dad when he was two, at Sugar Bowl. He had an extensive racing career starting at Sundance when he six, and raced for over 20 years including time with the U.S. Ski Team. 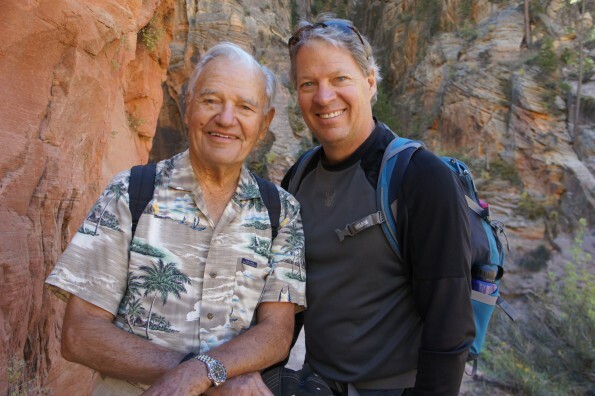 He became director of the Snowbird Sports Education Foundation in the late ‘80s and helps coach the Snowbird ski teams including Alpine and Big Mountain Free-Skiing. The programs currently has about 250 athletes and 50 coaches. It was an experience he was able to share with my dad when Junior joined him for 2 of the 8 years they ran the tours. He still skis with his dad, they’ve already been out a couple of times this year.